THE LATEST Cell-IQ software from TAP Biosystems enables walk-away monitoring, recording, and quantification of changes in cell morphology with up to three different fluorescent dyes. 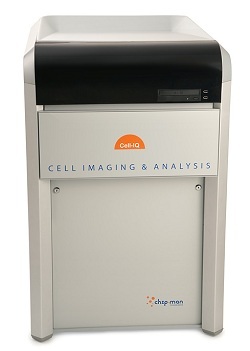 This makes it ideal for scientists seeking flexibility within a single stem cell imaging system, says the company. Cell-IQ comes with two plate positions with independent gas supplies, allowing cells to be to be maintained for days or weeks, side by side, in normoxia versus hypoxia conditions. This allows researchers interested in determining how stem cells behave in these environments to use it for long term observation, promising consistent data quality with minimal intervention. Researchers can train the Cell-IQ to recognise characteristics such as phases of cell attachment, scratch wound proliferation, and migration assays. After an analysis has been programmed, it can be reused to generate extensive sample libraries for later application in the laboratory. JoAnne Montalbano, TAP Biosystems’s product specialist, said: “With Cell-IQ software you can easily see fluorescently labelled morphological features and track reporter genes. Alternatively, label-free imaging can be used for stem cells going through to clinical studies. Cell IQ offers flexibility of analysis, and we look forward to discussing with scientists how the system can support their work with stem cells”.